Emile's Home-Brewing Site: Hoe does it Work? Every individual phase, along with the coordination of these phases, is being taken care of by the brew program. So any description of an event here is fully automated by that brewing program. The pans / brew kettles: these pans have sizes of 150 L (Hot Liquid Tun, HLT), 115 L (Mash/Lauter Tun, MLT) and 140 L (boil kettle). This brewing setup is a so-called HERMS system. 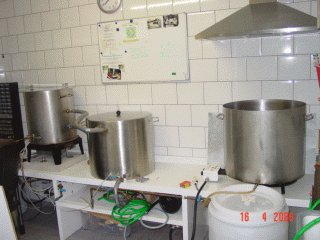 The picture shows most of the brewing setup. 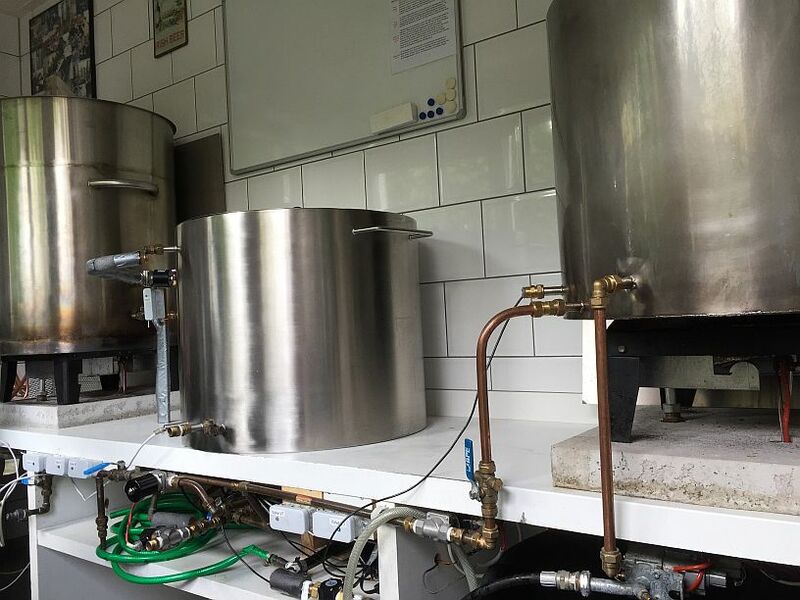 The Hot Liquid Tun (HLT) is shown on the left side, The Mash/Lauter Tun (MLT) is shown in the middle and the boil kettle is shown on the right. The pump and the CFC are not really visible (behind the copper pipes and the green hose in the lower compartment). MLT, Mash Lauter Tun: this is the kettle, where mashing takes place. It contains the malt with the water. This is a double-walled pan, with isolation in between. The total net volume is 115 L.
Boil, the boiling kettle. The result (called the 'wort') from the mashing phase is collected here. The hops are added to the wort, and then the wort is brought to a boil for 2 hours. I start by rinsing all the pipes. Then I close all valves, except for V8. This valve has a special function, that of pump by-pass. You can use it to regulate the net flow through your system (I have measured values between 3 and 12 litres per minute). Next I check all the pipes (connected with quick-connect couplings). I fill the HLT with fresh water, then the brewing program takes over and lights the burner until the HLT temperature is 57 °C. The heating of the water in the HLT can also be controlled with a time-switch function built in the brewing program. You set a time and a date and at that time, the brewing program switches on the heater. So if you are ready for some brewing early in the morning, the water is already at strike temperature! Then, V2 and V4 are opened and the pump is activated. The desired amount of water is pumped from the HLT into the MLT. During this, valve V1 is opened, so that I already have a flow from the MLT through the pump, through V4, through the heat-exchanger (in the HLT) and back again to the MLT. After reaching the desired volume in the MLT, valve V2 is closed (the pump remains on all the time). The next thing to do is to add the milled grain to the water in the MLT. During a mash-rest, the water in the HLT can already be pre-heated to the next required mash-temperature. To prevent that the MLT is heated as well, the pump is switched off during pre-heating. The mash water is circulated continuously (MLT -> V1 -> pump -> V4 -> HLT heat exchanger -> MLT). 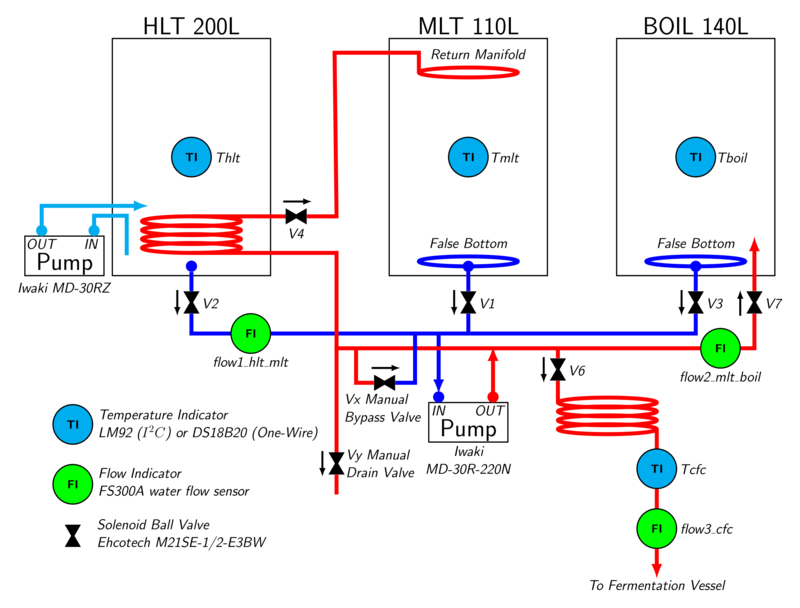 By increasing the HLT temperature, the program can also increase the MLT temperature. Experience shows that the initial HLT temperature should be about 3 °C higher than the MLT temperature. So if I want 52 °C in the MLT, I set the initial HLT temperature to 55 °C. After mashing is complete, valve V7 is opened and a part of the wort is pumped into the boil kettle. The program stops pumping when the desired volume is achieved. Then valve V7 is closed again and V2 is opened. The water level in the MLT will increase again, because fresh water from the HLT is added to the MLT. If the desired volume is added, valve V2 is closed again. The program recirculates this for 15-20 minutes through the mash. Then valve V7 is opened again and some of the wort is pumped into the boil kettle. The program repeats this 4-5 times (adjustable within the program). So if 50 L of sparging water needs to be added, the program adds 5 times 10 L (or 4 times 12.5 litres). During the entire sparging phase, the program controls the HLT temperature and keeps it close to 80 °C. After sparging, all wort has been collected in the boil kettle and the pump can be switched off. All valves are closed again. I make sure that the burner under the boil kettle is lighted as soon as possible. I want to start boiling just after I finished sparging. I add the hops and boil for 90-120 minutes. Meanwhile I clean the MLT. When boiling is finished I let the wort rest for 5 minutes, Then I connect the counter flow chiller to the water tap and open V3 and V6. The pump is switched on and it pumps the hot wort through the counter flow chiller into the fermentation bin. The counter flow chiller is extremely efficient: it is able to cool 50 L of wort from 100 °C down to 20 °C in approx. 10 minutes. The cooling water that comes out is boiling hot (ideal to clean things with). If all wort is pumped through, the pump is switched off. Then cleaning can start. I pump the remaining hot water from the HLT through all the pipes and the counter flow chiller. Great! I initially encountered some problems, such as a leaky pump and unreliable thermometers. But having a pump makes a big difference. Temperature is much better to control. And you don't have to walk around with heavy pans anymore. No more waiting for an hour to cool things down. I managed to save several hours compared to the setup without pump and counter flow chiller. Another advantage is the flexibility of the computer program. I wrote the program in such a way that all process parameters are adjustable, such as the number of sparging batches, or the P, I and D values of the PID controller. Parameter values are saved automatically in the Windows Registry, so that when you restart the program, these parameters are set to the latest value. And if I require functionality that can not be realised with changing parameters, I write an update of the brew program. In this way, a number of updates have been realised! One of the striking things in this graph are the sine-waves / ripples in the HLT temperature (yellow line). It is an indication that the PID controller has not been set properly! 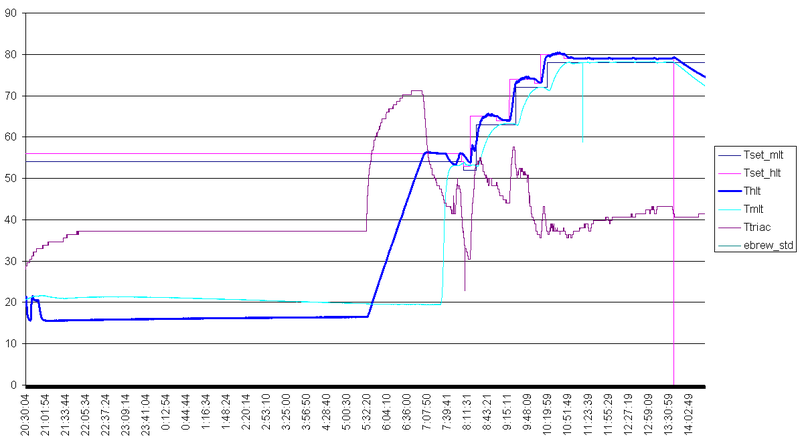 The second graph (below) shows another response, but then from a properly set PID controller. The HLT temperature is, in this case, the fat blue line. The ripples in the previous graph are almost completely gone. The temperature is controlled to within 0.05 °Celsius. You can barely see 5 little peaks in the graph (at the right end of the graph). These are the moments that sparging water from the HLT is transferred to the MLT. But the PID controller reacts very well to this disturbance.